Cardfight Pro: How Long Can the Golden Goose Keep Laying? Photo by rawritzrichii, seek consent before reposting. In light of the December 9 results and the close of the 2012 World Championship, one thing has become clear; the Gold Paladins are strong. They have become the third most prolific clan in history, on the heels of Kagerou and their Royal predecessors. Being able to fill the field, draw new cards and break traditional defenses with powerful limit breaks are all key aspects of their success. Bandwagoning is also an element here--if 98 out of 100 decks at a tournament are Etranger, then at least 6 of the top 8 decks will be Etranger regardless of if those decks are any good. Even considering this however, the strengths of the clan are very real. At the very least, Smith, Bastianelli and Fernau did believe in the clan's power. In the world of pros, they are a real threat, but like any other threat they have weaknesses. In particular, their dominant weakness has been evident since the first booster set. 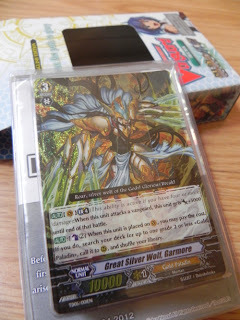 Garmore is the best card that the clan has ever printed; Ezel is only ever run for the opportunity to superior ride him, and occasionally his autoskill when stalling for Garmore. If the Gold Paladins had an exact copy of the King of Knights or of Soul Saver Dragon, that would be run instead. Spectral Duke Dragon is not the monster in Japan that he is on our side of the Pacific, because his sometimes-on sometimes-off +1000, intended to attack independently multiple times in a match, functions poorly in a format where stable 11000, 12000 and 13000 dominate. Even the Gold Paladins' coming crossride, Platina Ezel, is considered vastly inferior to previously-revealed crossrides that were not reliant on being at five damage. The End and even Goddess Amaterasu woul be run instead if they had Gold Paladin equivalents. Probably the most harrowing difficulty for the clan is that the general design theme is "Royal Paladin but weakened." There is no doubt that if sets 4 and 5 had been available during WCS2012, the clan would have been vastly undermined by Majesty Lord Blaster. This leaves a pressing question for the western community of Gold Paladin cardfighters who have grown endeared to their clan. Come February, BT05 will be available, and by all estimates will be a serious factor in WCS2013. Where does that leave the Gold Paladin cardfighter? For how long can the golden goose keep laying? This is entirely dependent on BT10: Triumphant Return of the King of Knights. The recent team tournament results have shown that both primary variants of Gold Paladin can work well on the same team as Royal Paladin and Oracle Think Tank decks, much as Kagerou did in the 2011 Grand Prix team tournaments, but Platina/Spectral Duke is also competing for that space with Dragonic Kaiser Vermillion "THE BLOOD," who has seated himself as a new, ultimate break-impaired The End. We have yet to see how Platina holds up to its contemporaries in the seniors' and juniors' divisions, or to the new, Tsukuyomi-derived Blaster build. Liberator Gancelot is an excellent replacement for Platina, hitting 23000 on-attack with Tron or Llew and throwing a second Gancelot up to 33000 with his break ride. Gancelot is not just an upgrade, but also a countercard that close to replaces the BT09 play style. However, one card cannot carry a clan. The Liberator subgroup is definitely one of the most powerful subgroups to ever be designed, but like all Gold Paladin decks, it is still reliant on first vanguards that depend on Ezel or Pellinore. Running Corron or Kyrph means running Ezel and/or Gareth with Beaumains, severely restricting a deck that would ideally be composed as close to as purely of Liberator units as possible. Running Spring Breeze means running Lop Ear Shooter and potentially Dindrane for an overall similar restriction, but even more than that, it means running Pellinore who has been ruled as not being a superior ride and as a result, canceling Gancelot's carefully-prepared break ride. Gold Paladin cardfighters are left holding out for the new Wingal Liberator and with him the new Alfred, leaving the future murky and uncertain for a clan that in Japan was repeatedly established as underdogs. Even beyond this, the Eradicator and Dudley subgroups are already receiving quite a bit of attention from pros as more likely to replace Spectral Duke and Garmore/Gancelot, respectively. The English pro scene will soon be left to clash over the set that will finally induct us into the crossride format that has defined much of Japan's professional play for the past year. Despite that, it is already clear that The End will not be storming the format as some doomsayers have predicted. There are two reasons for this; first, the English scene is becoming updated with the more recent sets at a relatively fast pace, introducing new counter decks and reinforcing past decks. Second, the focus of Vanguard has shifted. We are at the end of an era--you could call it the end of the vanguard. Powerful vanguards are no longer a concern in the new format. No matter how much power you gain or extra critical you add on, this cannot circumvent a perfect defense card, cards which in the English format have been standardized at four copies by limit break. While some predictions say that Glory Maelstrom will respond to this by ending the perfect defense, the situation is not equal. While he does get over Duke's base power consistency issues, the new Maelstrom can only do this when he is on the brink of death, and it's clear from playtesting by now that fighting a Maelstrom deck is a matter of changing one's play style. Shields are placed earlier and more frequently, the rearguard becomes the focus of defense, and the vanguard is either not guarded against or grade 0s are conserved for fighting Glory and perfect defense goes to the rear. The situation plays out like jan-ken-pon; the Gold Paladins are undermined by Majesty, who is locked down by The End, who is shut out by Gold Paladin counterdecks that are defeated by Majesty. The most prominent major player living outside of these restrictions is Oracle Think Tank, whose CoCo and Battle Sister play styles neatly stops both the Blaster deck and crossride decks in their tracks, but even they then fall to the Gold Paladins. To who does the throne at the top of the world go to from here? This year's cup is open to everyone. I am not in the business of naming kings. Blaster Blade Liberator will probably be revealed close to or over the weekend, being the final card from TD08 and TD09 to go unrevealed. This unit will be our last chance before February to gauge the new Gold Paladin, and with it how the Gold Paladin cardfighters of the previous year will plan for WCS2013. While my own investment is strictly centered on my personal clan, it will be interesting to see cardfighters both in the United States and abroad rethink their strategies. The natural position, even not knowing exactly what BT10 will bring, is to assume that Gancelot will be supported by Alfred, with extra copies of the Liberator himself replacing Gigantech Destroyer and Manawydan as a rearguard grade 3, but some fighters may still stick by Garmore or even find the "perfect" offensive grade 3 in Dignified Gold Dragon, who combines the Silver Wolf's and the Destroyer's roles into a single unit. How will traditional Gold Paladin fare once the Liberator subgroup hits the scene? Spectral Duke is largely forecasted to fall into the background in the February-on format, but is there some innovation remaining to rework the deck? Furthermore, there exists an interperiod between the release of trial decks 8 and 9, and the coming of BT10; while there are no official tournaments hosted in this period, there will be ample time for casual play and experimentation. Will we see them synthesized with Platina in an offshoot deck as Galahad and Soul Saver were once synthesized by Masuda? The parallels are interesting; Gancelot and Alfred were once the first and perfect Royal deck, but were outmoded within three months by BT02's Soul Saver, and yet here we are, once again looking at Gancelot and Alfred, this time as the last Gold Paladin deck. Maligned and potentially unhealthy in large doses as they are, Cardfight does not end with the Gold Paladins. The scene has only evolved further.